Jacques loves being warm. He loves sunning himself outside, perching in front of the fire, snuggling in fluffy blankets, and hogging the space heater. But apparently he also loves to run, roll, plow, and grunt in the snow. If you listen closely to the video, you can hear him grunting. And you can hear my husband and me giggling. As the day went on, we got more snow… maybe two inches. 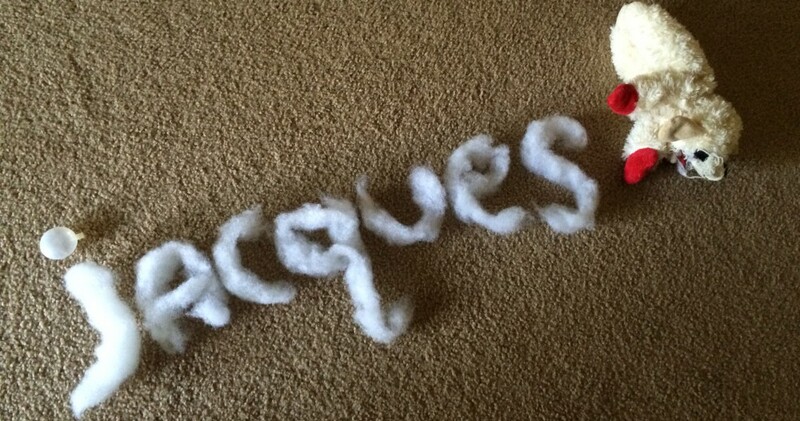 Each time we let Jacques outside. He would do the same thing – run in circles, plow through the snow with his face, and do doggie somersaults. I think his best was about six somersaults in a row. Anytime he came back inside, we would towel him off to try to get the matted snow off him (usually to no avail). It didn’t matter much because he would wind up in front of the fire to warm himself then want to go outside and do it all over again. So, I guess he likes to run through the snow as long as there’s a fire to warm up by. Such a ruff life he leads!